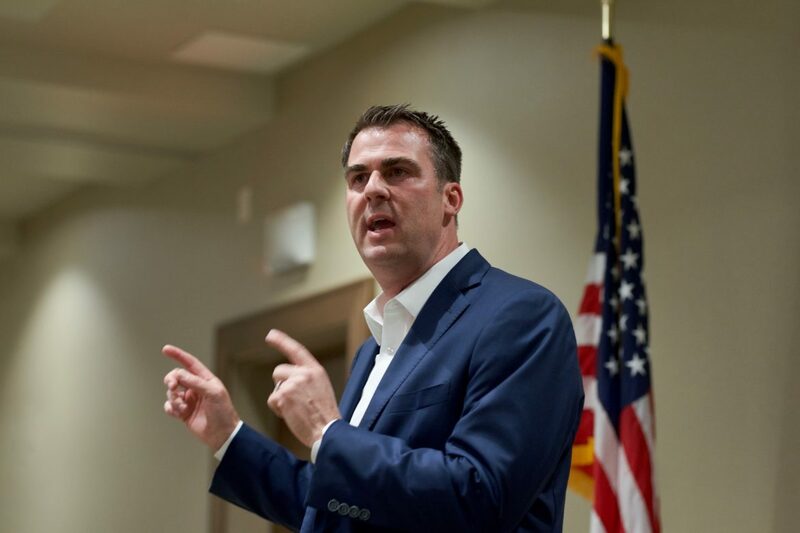 Kevin Stitt is shown speaking at a forum hosted by Edmond Republican Women on May 21. Republican gubernatorial candidate Kevin Stitt’s mortgage company did not tell Wisconsin officials about its run-ins with other states’ regulators when it applied for a mortgage banking license a decade ago, according to documents obtained by Oklahoma Watch. Regulators detected the missing information, and Gateway Mortgage Group agreed to pay a $4,000 fine. Gateway applied for the license in July 2008 but didn’t disclose the company had previous settlements or consent orders in Nebraska, North Carolina and Mississippi. In doing research, Wisconsin regulators found four cases against Gateway in the other states and attached copies of them to the consent order, which Oklahoma Watch obtained through a public-records request. After agreeing to pay the fine in early 2009, Gateway was granted a license in Wisconsin but stopped doing business there in January 2011. It later reapplied for, and was granted, its Wisconsin license in May 2014. Stitt, who has touted his business acumen in his run for governor, said through a campaign spokeswoman that the Wisconsin matter was a clerical error. “This was simply a clerical error where the wrong box was checked,” said spokeswoman Donelle Harder. “Gateway corrected the application and was issued a license in 2009. Gateway voluntarily left Wisconsin for a season because the company believed it was not in a position to be competitive in that market at that time. Stitt’s business history has been cited in attack ads by competing gubernatorial candidates Gary Richardson in the GOP primary and more recently in Stitt’s runoff with former Oklahoma City Mayor Mick Cornett. The ads and a website have pointed to disciplinary consent orders between Gateway and mortgage regulators in Georgia, Tennessee, Arkansas, Illinois and Kentucky, as well as the three states listed by Wisconsin regulators, between 2005 and 2011. Stitt’s campaign has said most of the regulatory actions stemmed from employees who were later fired when the misdeeds, ranging from unlicensed loan officers to a mortgage fraud scheme, came to light. Several of the cases arose in the years surrounding the 2008 financial crisis. Gateway now operates in more than 40 states. The Wisconsin order and civil penalty were mentioned by Tennessee officials in 2013 when one of Stitt’s companies, Reliable Appraisal Management LLC, applied for an appraisal license in that state. The case was included in Tennessee officials’ summary of previous regulatory actions involving Gateway. The summary only mentions that Gateway “failed to properly complete the application for mortgage banker license” in Wisconsin. The consent order obtained from Wisconsin describes the improper action by saying the license application contained the following question: “Has the applicant ever been the subject of disciplinary actions including, but not limited to, civil forfeitures, cease and desist orders, injunctions, license suspensions, denials, revocations, warnings, reprimands, enforcement actions, probation and limitations by any regulatory agency in this state or other state? Provide details about the regulatory action including, but not limited to, date, regulatory agency and type of discipline.” The “respondent” with Gateway, who isn’t named, answered, “No,” the consent order says. The Wisconsin fine was less severe than sanctions against Gateway and Stitt in Georgia in December 2009. Regulators there banned Stitt personally for five years, and the company permanently, from the mortgage business in the state. Regulators said they found violations of the Georgia Residential Mortgage Act, including making false statements and misrepresentations of facts to lenders and failing to maintain a mortgage loan transaction journal. Neither the company nor Stitt admitted wrongdoing. As part of the consent order, Gateway made a $2,000 contribution to a group that maintains the Nationwide Mortgage Licensing System. In June, Georgia regulators amended the consent order to lift the permanent ban on Gateway from doing business in the state and replaced it with one lasting eight years starting from the time the consent order was signed. That meant the ban ended last year. Gateway had submitted documents in support of lifting the ban, but those records are confidential under Georgia law, said Bo Fears, deputy commissioner for legal affairs at the state’s Department of Banking and Finance. Harder, with the Stitt campaign, said Gateway applied to end the Georgia ban last year. In retrospect, Stitt and Gateway were too quick to agree to the 2009 consent order and questioned whether Georgia officials had the authority to issue a permanent ban on the company. When Stitt applied for an appraisal license for Reliable Appraisal Management in Florida in 2011, he disclosed the Georgia enforcement actions against Gateway and himself. But the application didn’t mention regulatory actions in the other states. Harder said neither Gateway nor Stitt were under any obligation to tell Florida regulators about consent orders in the other states. Georgia was the only state that sanctioned Stitt personally, while the other states’ enforcement actions involved Gateway as a separate company, she said. A memo sent to Gateway employees on Aug. 10 by new CEO Stephen Curry implored employees to “Stand Tall” in the face of questions about the company in the gubernatorial campaign. Curry took over Aug. 1, although Stitt remains as chairman. Curry said in the memo that Gateway has received licenses to do business in 24 states since 2009 as well as approvals to enter other lines of business, including a tribal housing program offered by the Department of Housing and Urban Development and as a lender under Freddie Mac.